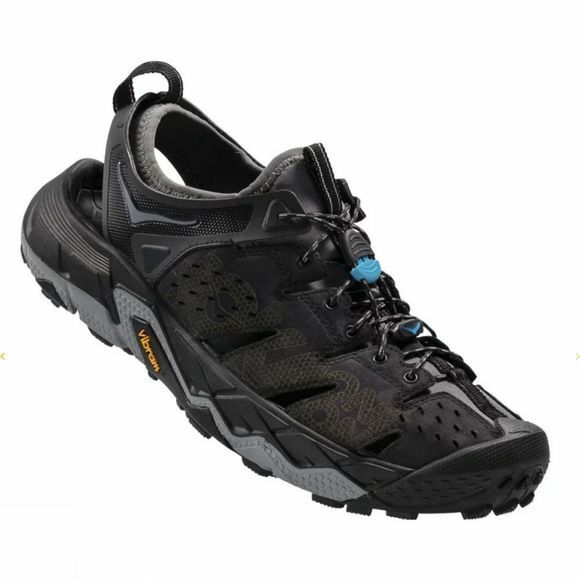 The Men's Tor Trafa Shoe from Hoka One One is an outdoor athlete’s dream. Rugged but light, supportive yet fast. Imagine crossing a 4x4 with a sports car that has the most comfortable bucket seats ever - thanks to Hoka One One’s placement of soft EVA inside an RMAT midsole frame. Its strategically placed flex grooves add a torsional flexibility to the shoe that allows you to negotiate changing surfaces and with an extended rubber toe-cap, and neoprene booty, it offers protection and soft feel in all the right places. Topping it all, nubuck leather adds a durable and quality finish to the upper. This shoe is begging for adventure.